Ben & Jerry's gives a different look/taste to one of their best-selling flavors with the release of new Chocolate Cherry Garcia. 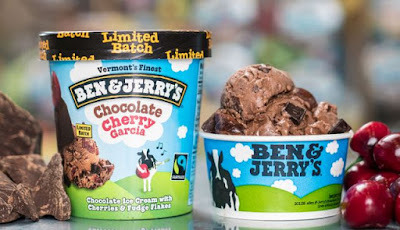 The new flavor takes the company's signature Cherry Garcia and replaces the cherry ice cream with chocolate ice cream, which gives you chocolate ice cream with cherries and fudge flakes. Available for a limited time, Chocolate Cherry Garcia can currently be found in Ben & Jerry's Scoop Shops nationwide and is rolling out to grocery stores soon as a Limited Batch flavor. The new flavor is the third classic Ben & Jerry's flavor to receive their "Flavor Flip" treatment. Earlier this year, they launched Totally Baked (a twist on Half Baked), and Tubby Hubby (a different take on Chubby Hubby).